As part of the oral cancer screening we perform on all patients at every recall visit, we utilize our state of the art Sapphire Plus Lesion Detection system for Oral Cancer. Oral cancer is a serious condition that affects approximately 40,000 Americans annually and claims approximately 8,000 people per year in the United States. That is approximately one fatality per hour due to oral cancer in the U.S.! Traditional screening for oral cancer and other suspicious lesion in the oral cavity is done with the naked eye and by feeling the tissue for abnormalities. In our practice, this is done first by one of our excellent hygienists and then either Drs. Calcaterra. But research has consistently shown that some premalignant and malignant lesions cannot be detected using these methods alone. As a result, we introduced a proven technology several years ago to allow us to more effectively screen for these serious conditions. 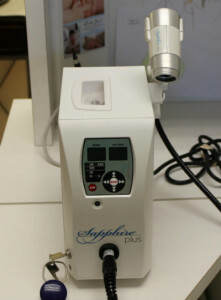 The Sapphire Plus system works by projecting a safe but focused blue light into the oral cavity. This light excites certain types of tissue present in the mouth. 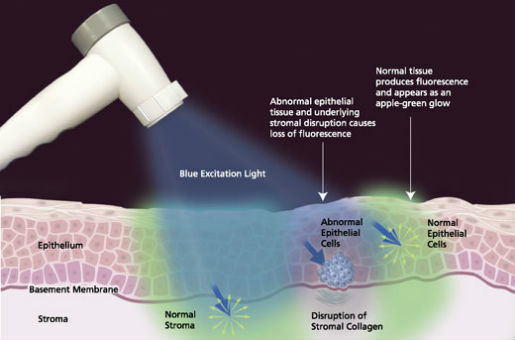 Abnormal tissue, which includes premalignant and cancerous cells, will appear differently than normal tissue. We utilize the Sapphire Plus screening system during regular recall visits (dental cleanings). It is a critical part of our comprehensive oral cancer screening. We will use it if we see a questionable area, if you are at higher risk for oral cancer, or in some cases just on a routine basis. Feel free to ask either Crystal or Toni or either Drs. Calcaterra about it at one of your next visits.